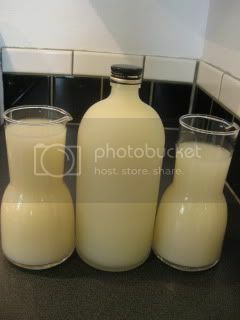 After doing some research on various websites, I decided to make my own version of Makkoli (or Makgeolli), which is basically Korean-style rice wine. It's like Japanese nigori (cloudy) sake, but the basic difference is that Makkoli is made mainly from sweet rice (mochi rice). I had a real fun making it. Making the nice chewy rice is an important part of making good makkoli. 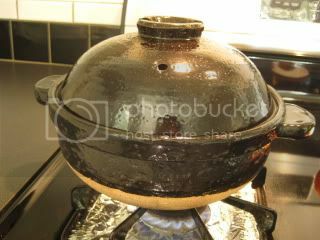 I decided to make it with 100% sweet rice, with my double-lid donabe rice cooker, "Kamado-san". It's a simple sweet rice...3 rice-cups (540 ml) of sweet rice ("mochi rice") with the same amount of water. 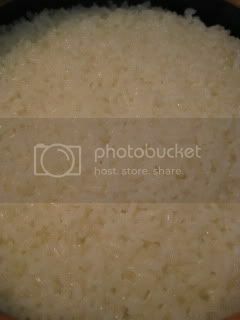 Rice was pre-soaked in water for 30 minutes. 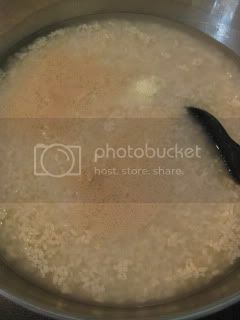 The rice was cooked so nicely and I just couldn't help tasting it...it tasted so delicious. I wished I could've just eaten a big bowl of it. 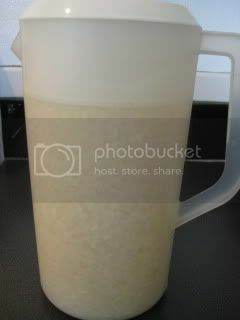 The cooked sweet rice was mixed with 1 liter (1 quart) of filtered water. At this point, the mixture is 105-120F (40-50F) degrees. 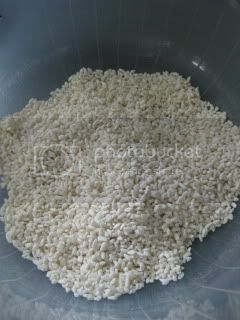 Then, 200 grams of dry rice koji (chunky crumbles were broken by hand to separate grains) was mixed in. 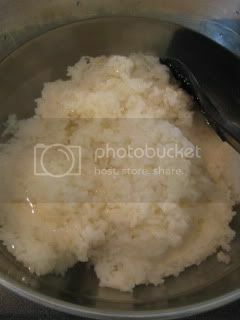 I used very nice rice koji from Komego from Fukui, Japan. 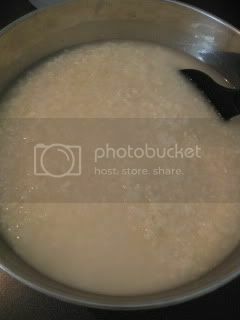 Some vendors sell dry rice koji online here in the US also. 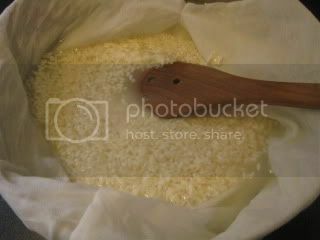 Rice koji is an essential starter for not only makkori or sake, but also miso, soy sauce, etc. 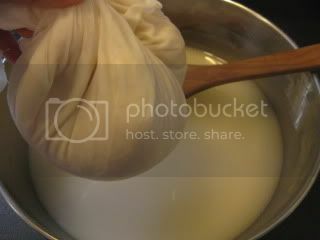 1/2 teaspoon of dry yeast and 1 gram kefir culture (yogurt starter can be substituted). All the ingredients were stirred well together. 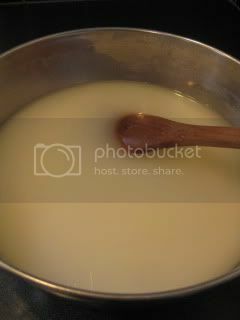 *Too hot temperature would kill koji, yeast, and kefir culture. Too low temperature would prevent them from working properly. It's then left at the room temperature for 4 days (no direct sun light). On the 2nd day, I did a "punch down" once. On the 3rd day, the aroma was quite milky and nice, but I decided to let it sit for another day. On the 4th day, it was time to strain the liquid. It smelled so nice and very makkoli-like. I used a regular strainer and cotton bag for straining. 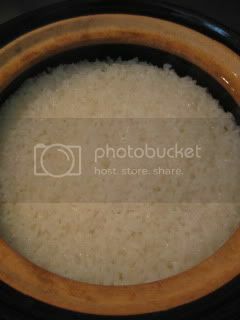 The solid (donabe-cooked sweet rice and dry koji rice) were broken down to very soft sediment. Once most liquid was strained, I squeezed out the remaining. Here's the freshly made Makkoli! And, here's the wonderful by-product..."sake kasu" (sake lees). 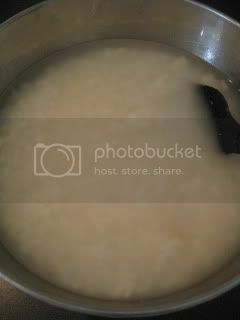 After squeezing out the liquid, there was only about a little over 1 cup of sake kasu was made. I transferred it to a container. 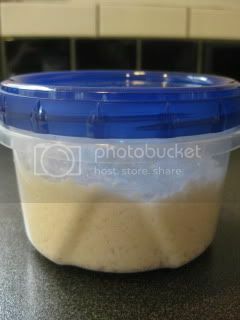 I can use it for making sake kasu marinade for fish, sake kasu cake, sake kasu hot pot, etc. 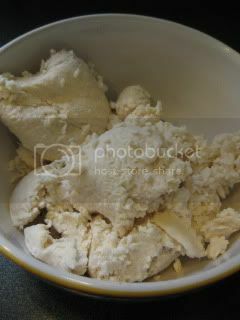 I'm so looking forward to using my first house-made sake kasu for my cooking. Voila, the final version of my homemade makkoli. Total almost 2L (2 quarts) amout was made. I had a glass and it tasted really delicious! It had the nice milky flavor, combined with fresh sour/ tartness. I finished a glass and realized it tasted higher in alcohol than a commercial kind. It was still in the morning, but I was feeling like a party.